I wrapped Star Wars: The Force Unleashed and am awaiting the arrival of BioWare’s Sonic Chronicles: The Dark Brotherhood for the Nintendo DS. It’s the first BioWare title released since I’ve left the company. It’s also, even though it was in development while I was with the studio, a game for which I did no work. So I’m kind of excited to give it a spin even though I hear it’s fairly simple. But more on that later. For now, let’s finish off my thoughts on Star Wars: The Force Unleashed. Skills & Balance: As you play, you gain points to develop your character. You gain points that affect which combos you can access, which Force powers you can use and how powerful they are, and various other factors such as health recovery and how long you can use the Force before tiring. My problem is that I never felt more powerful as the game advanced. In fact, I feel less powerful than I did at the start of the game because the opponents have become so much more difficult. Maybe I could only fling a single soldier at the start instead of the three I could grab at the end, but by the end many of my opponents resisted that ability entirely. Meanwhile, various droids are tossing rubble at me and generally looking like more of a Jedi than I do. So while I walked through the early levels without feeling as if there was anything to threaten me, now I’m nearly as powerful as I can be and yet I’m doing cheap hit-and-runs to keep from dying. Kind of strange for someone who can pull a Star Destroyer out of orbit and crash it into the planet’s surface (albeit in a most tedious display of power). Maybe this plays to the type of design I’ve been brought up on at BioWare, but my belief is that you should feel strong as you travel through a level and fight the level fodder — i.e. grunts. You shouldn’t need to use any of your resources or strategy, and should only lose a small bit of health as you fight them. Against sub-bosses, you should lose a significant bit of health and resources and require some strategy. And then against the level’s primary boss, you should lose a lot of health and resources, maybe even die a few times as you figure it out. I don’t think the Force Unleashed subscribes to the same balancing strategy. I beat some bosses with minimal effort on the first try, and got stuck in some fights against waves of fodder. Side note — at the start of each level you inexplicably get an entirely new power. Considering you’re fighting Jedi, studying under Vader, and later teamed with Jedi Master Rahm Kota, you’d think there was plenty of opportunity to explain where these powers were coming from. Opportunity lost. Light Side/Dark Side: Darth Vader tells me he wants to fly around the universe killing Jedi. He delivers a pilot to me, but then I later discover that this is the 7th or 8th pilot I’ve employed. Pilots are disposable. So why, after the big “twist” in the story, am I fighting so hard to rescue the latest in a long line of disposable crew members (and why is she imprisoned in such a large, elaborate cell)? My player says, later, that he needed a pilot, but the unspoken suggestion is that they have a bond/budding romance. But she’s done nothing special to this point. Even a simple romance might have a scene where, for example, the ignored pilot does something special to attract my attention. Maybe she saves us. Maybe she saves the ship. But my character stops and realizes that this pilot is different. That never happened here. I guess I’m supposed to understand that I’m becoming the good guy by working with the Jedi (*for* Darth Vader) — but I could not care less about any of these people. Except the robot, Proxy. And the ending — OK, this is a spoiler for those who haven’t hit the ending. Don’t read on if you don’t want to be spoiled. but the ending? You fight Vader after he has twice betrayed you. The first betrayal is actually forgivable (it’s a cover-up to re-hide you from the Emperor) and the second time is kind of your own fault (because you apparently become sympathetic for the rebellion), though he asserts that he never liked you (this is a good scene and feels like Vader is going against his desire, which he later submits to with his son, Luke, in the movies). At this point I didn’t want to kill Vader, but rather side with him against the Emperor as was the original plan. But Vader blocks your progress to the Emperor, forcing you to defeat him. After the fight you have a moment to decide what to do. The Emperor, the man you want, is killing Kota — a man you may not care for all that much. Do you rush to the rescue of the man you once tried to kill? Or do you stay to embrace the dark side and finish off Vader? Neither option held interest for me. I went after the Emperor because it seemed like the obvious choice and was my original plan as Vader’s servant, but I did not do it out of loyalty for the rebels or Kota. The game finishes with a movie showcasing your impact on the lives of the rebels, and more love talk from the pilot, even though there really wasn’t much of a connection in the first place and you “betrayed” them all later. But I guess all that matters is that you redeemed yourself in a fight with the Emperor to let them escape. Bottom Line Summary: When I started this game I really liked it. I loved manipulating people and objects with the Force. I liked fighting. I liked that it was Star Wars. And I wanted to see that progress. But the longer the game went, the more disillusioned I became. It was the feeling that more polish time may have resulted in a better game. And that’s where I’m left. 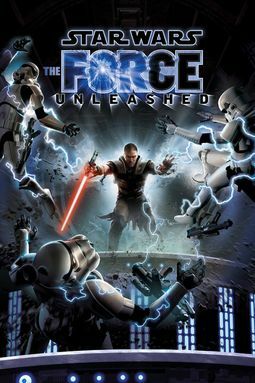 I’d rate The Force Unleashed as good, overall, but it could have been so much better. So will I play the inevitable sequel? It will really depend on what changes. And if nothing changes, I just might pass. Second impression? Shouldn’t there be a first? Well, truth be told, I played the heck out of the demo when it first came out a year-and-a-week ago. That would have been the best time to make a first impression post. So we’ll move on to the second impression. Physics: This is one of the game’s high points. You can (and I did) literally spend hours picking people up with the Force and throwing them or dropping them or running them into other people or pulling them close to you and watching them dangle — all just to see how it works. The first time you grab someone and watch him grab for a railing or grab another person, you’ll be hooked. At one point, I accidentally (during fighting) broke a bunch of elevating platforms that led to a power-up. At first, I was going to forget about it or re-load in order to get the power-up, but then I decided to see if I could make a stairway with junk from around the room. And? It worked. I easily manipulated in-game objects using just the left and right analog sticks. That was awesome. Pop-In: There’s a lot of pop-in with this game. I remember working on Knights of the Old Republic and the lead designer saying that we should never see enemies pop in. That wasn’t possible, but we did everything we could to minimize it. But in the Force Unleashed, I’ve seen all sorts of things pop in to existence. I’ve also seen a lot of texture pop-in, where — as you get closer to an object — the texture improves in quality. I suppose that’s a hard one to hide and pretty forgivable, but it seems like it could have been minimized a little bit more than it is. Maybe if there were less stuff all around you, the pop-in would be unnecessary. Jittery Feel: The game has a jittery feel to it, like there are missing animations. You jump from Point A-to-Point B or swing at an opponent and sometimes it’s so fast that it’s hard to control — quite at odds with each of the last two Prince of Persia games I played which felt very smooth and much more easy to control. As well, there’s quite a bit of screen tearing — suggesting at some problems with the frame rate that lend to the jittery feel of the game. And then there was the time when an opponent threw an object at me and I locked on to it with the Force — only to watch the object fly past me forcing the camera to spin wildly. I can’t measure the frame rate on the Xbox 360, but I wonder how far they’re pushing the capabilities of the machine. Again, I would have preferred them pulling the details back a little and making it smoother. Lock-On: Lock-on is a weakness for this game, which is a shame because it’s the basis for a very impressive Force/physics system over all. And what I mean is that as you travel through levels, you can use the Force to grab or manipulate a huge assortment of objects scattered throughout every level. That’s the perfect building block for fun. But let’s put it this way: if I’m in a room and there’s a bomb on the floor and a rancor running at me, it should be obvious if I’m roughly facing the bomb that I want to fling the bomb at the rancor — and not pick up a nearby rock and throw it straight up. There should have been better weighting of object importance and less objects to distract from your focus. The Music: I like that they use the familiar Star Wars themes throughout the game, but if I’m walking down a hallway with nothing going on it gets really irritating really quickly if I’m forced to listen to the loudest and most dramatic music for that sequence. How about we save the dramatic music for the boss fights and use some soft ambient melodies for the exploration and grunt-fighting areas? The Combos: If you’ve read past reviews of mine, you know I’m not a fan of the intricate and complicated combination system. Here’s my deal: if I’m playing a game for 10 hours, I have no interest in memorizing 50+ different attack combinations. It is not worth my effort. So what happens? I more or less spam the controller. I know that all four face buttons can lead to attacks directly or indirectly, so I hit them all and hope it works. Sometimes I stumble across a good combo and remember it (such as [X] followed by two helpings of [Y]), but more often I lean on what I already know or rely on continually hitting the attack button [X]. In a game where there are dozens of ways to swing your lightsaber, plus several ways to use the Force, I wish they would have put some effort into making all those methods accessible to the more casual player. Is that just me? Do others out there love memorizing that [X], [B], [X], [X] is an attack but [X], [Y], [B], [X] is not? Difficulty Balancing: Maybe this is another “just me” moment, but the game has some uneven balancing in my opinion. Some levels and bosses I completely mow through like they’re not there — and I’m not doing anything special. Other bosses and levels stymie me to no end — like that awful, skittering little robot Jedi you are sent to fight. Or the time I resorted to retreating back past the point where the opponents would follow me, and then resorted to flinging rocks at them because I had died at their hands a half-dozen times (I later discovered this is also known as “the second half of the game” — that’s some really epic Jedi heroism for ya, hiding and throwing rocks). AI: Let’s put this comment down to polish. 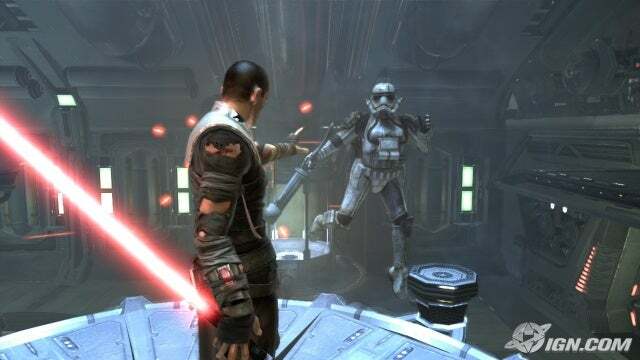 The Force Unleashed could have used some tweaking of theirs. For example, I’m standing on a ledge and an opponent is down on the ground below me. He’s tossing grenades at me but I’m so high up that he can’t hope to hit me. So what does he do? Continues throwing grenades, non-stop, in an arc that lands at the ground well below me. Then there’s the Jedi I just killed by — standing there and watching her walk into lava. Or there was the mech I defeated by watching him walk into a wall of electricity. Or the aforementioned skittering Jedi who used his entire reservoir of Force powers to do a non-stop Force Push attack — even though I was blocking and it was having little effect. Walkmesh: This follows the comment above. It could have been better. There are times when opponents try to walk to me and walk off the level and die. Or they jump up a small hill to get to me and fall over, dead; I’m not sure what happened to them. Then there are the times where I get stuck on the ground because it’s half-a-foot high and I apparently can’t walk over that — consistently. Or the times when an opponent gets stuck standing on my head or I get stuck on a wall or a hill. If they were having these kinds of problems during the testing phase, you’d think they’d put some better effort into making tighter rails for their levels or, at least, having some QA locate the most troublesome spots. I’m just waiting for the time when I fall out of a level and have to re-load. I’m no longer waiting. It’s happened. Several times. Level Map Loading: Some levels are larger and require a transition, mid-way. You’d think they would have done this in a peaceful zone or in a more intuitive location so it’s obvious what’s going on — like a doorway. But my experience with the game says this is not the case. I was fighting on one level, surrounded by foes and worried I was going to die. I sprinted down a corridor to funnel the attackers into a row and — the screen goes black. Then it’s the loading screen. Then I’m in an entirely different-looking location with no one around me. That’s the second or third time this has happened. Puzzles: Puzzles aren’t always clear. There was one stage where it appeared sparks were falling from above. Were they dangerous? I walked forward and died — so I assumed they were dangerous. I discovered I could bend some nearby walls to create an umbrella of sorts. My bending job was so bad that it didn’t appear to block any of the sparks, but I didn’t die this time. Did I solve the puzzle? Did something else kill me the first time? I’m not sure. Level Lay-Out: The levels aren’t always laid out well. It could be much more clear which direction you need to go. There have been a few times where I get turned around and walk back the way I came. And since new foes spawn in behind you as well, it looks like I’m going the right direction. I like that there’s a mini-map to help you out, but I like having the mini-map as an extra — not needing to rely on it entirely. Regardless, the mini-map doesn’t help for vertical planes. Also, there are occasionally weird glowing effects on walls that look like the holocrons, but they’re nothing at all. Why are they there? They only distract. Speaking of, the lighting system reminds me of Fallout — washing everything in a single color. For example, there’s the gold level where, wielding a gold lightsaber and wearing golden-brown clothes, you trek through a golden-brown desert/junkyard landscape. How about some in-level color variety? QTEs: A quick comment on the QTEs, I actually think they work well here. Yes, it’s hard to pay attention to the awesome sequence going on because you’re staring at the bottom of the screen so you can see what button you need to press — but I like that you can kill a tough mini-boss with regular gameplay or, if you hurt it enough and get close enough, you can launch a QTE that lets you get a more spectacular finish. I actually think they could have used more QTEs; the aforementioned puzzle (?) would have been a great example of where it could have fit. That wraps my itemized second impressions on the Force Unleashed. My bottom line so far is that the game has so much potential but it’s missing out on fully reaching it. That’s frustrating and disappointing. I enjoy myself while playing, for the most part, but I also curse a fair bit and am generally of the mind that while I will finish I won’t re-play. So there you go. I’m sure I’ll put together a few smaller posts on the title en route to completion, so stay tuned for those.